The Chinese government has clamped down on the amount of time youngsters can spend playing online games, according to the official news agency Xinhua. 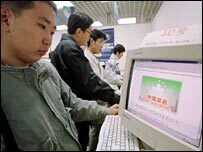 Online gaming is hugely popular in China. Beijing-based analyst firm CCID Consulting estimates that there are 17.8 million fee-paying gamers in China, about 20% of which are under 20 years old. A farther 10% are younger than 16. Determined gamers who play for more than five hours will get no points at all and face an on-screen warning that they are entering "unhealthy game time". This is the latest salvo in an ongoing war against alleged net addiction. Last month, the Chinese authorities banned any new cyber cafes from opening this year in an effort to combat addiction. It has also set up a department, charged with monitoring the content of games. Games which offer a view of history at odds with the official version in China, such as the Swedish game Heart of Iron which shows Tibet as an independent state, have been banned. Boot-camps have been set up to provide military-style training in an effort to wean youngsters away from the net. Julien Pain, of the press freedom organisation Reporters Without Borders, said he was unsure of how the Chinese government would impose the new restrictions. "With peer to peer networks gamers can download any version they want," he said. It is unclear whether the Chinese authorities intend to extend the restrictions to games developed in the West. If it did, Mr Pain said gaming firms would be willing to listen. "China is such a big and important market. Companies are ready to make compromises. We have seen it with Google, Yahoo and Microsoft and I can see gaming companies tailoring games for the Chinese market," he told the BBC News website .